I hope all is well in your corner of the universe. The track I bring you today is one of my all time favorite garage pounders, that I have loved for almost 30 years, but only scored a copy a few months ago. 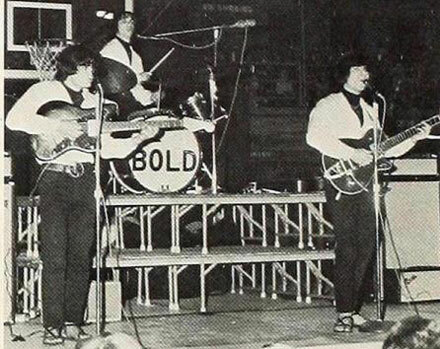 The Bold, aka Steve Walker and the Bold were a Massachusetts group that recorded a pair of 45s (one for Cameo, One for DynoVoice, both in a punk vein) and then an LP for ABC (much mellower) in 1969. I first heard ‘Gotta Get Some’ as laid down by the mighty Fuzztones, the kings of the NYC garage scene and a live act that had to be seen to be believed. As pure, unadulterated garage punk ‘Gotta Get Some’ comes off like an UR document of sorts, short, heavy, packed with fuzzed out guitars, snotty vocals and a wailing chorus. Almost exactly two and a half minutes long, it wastes neither time nor resources, bashing your ears in and then hitting the road. 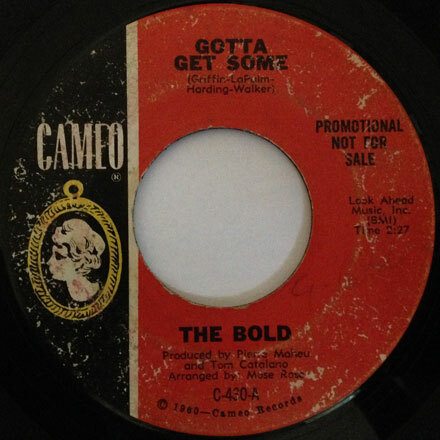 It is without a doubt one of the finest examples of the genre, and a 45 that I am very happy to have in my crates. I thought I come to you in the Christmas season with something different. As far as I can tell, I’ve never posted any comedy records here at Iron Leg (aside from the Homer and Jethro 45 from a few years back). 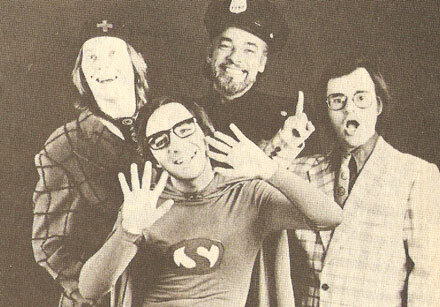 The Credibility Gap were one of the more interesting comedy troupes of the late 60s and early to mid 70s, an incubator of talent that would produce Harry Shearer, Micheal McKean and David L Lander. Shearer went on to be part of Spinal Tap (alongside McKean) and the Simpsons, with McKean and Lander making their mark as “Lenny and Squiggy”on ‘Laverne and Shirley’, with McKean going on to be a key member of Christopher Guest’s stock company. 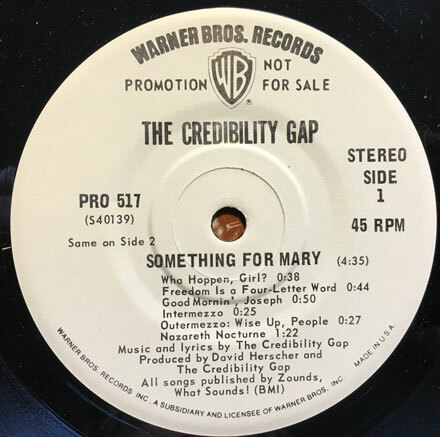 The Credibility Gap started out (with a bunch of different members) doing radio satire in late 1960s Los Angeles. The membership of the group evolved over the years to the point where the three members listed above – along with Richard Beebe – became the core. They made a number of albums for a few different labels (all out of print) and a couple of rare shorter pieces, like today’s selection. 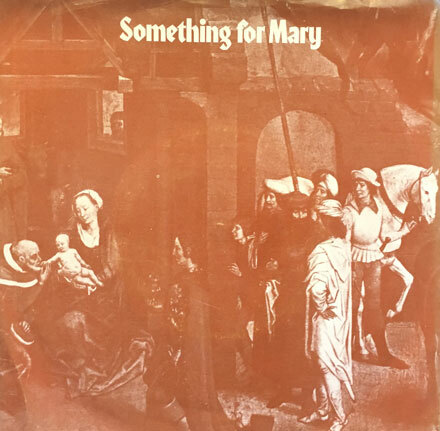 ‘Something for Mary’ was recorded in 1973 and released as a promo-only 45, with the stereo mix on one side and the mono on the other. It was a take-off on ‘rock operas’, whittling the pretentious construct down to its essence, clocking in a under five minutes, and telling the story of the birth of Jesus (VERY irreverently). 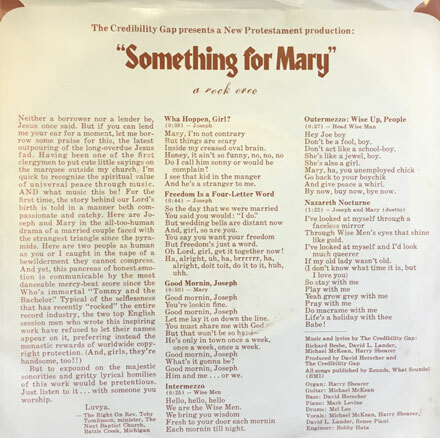 It bounces around between musical styles and references, tipping it’s hat to ‘Tommy’, Bob Dylan, the Three Stooges, musicals like HAIR and Godspell, and popular Christmas songs. There’s even a mock-funky drum break! The vocals are supplied by McKean, Shearer, Lander and Renee Plant, with both Shearer and McKean contributing instrumentally. It’s brilliantly weird, especially considering how compact the whole thing is, which also requires that you listen multiple times to pick up on all the references. It’s very cool, and hopefully, some time in the New Year I’ll do a longer piece on the group on the Iron Leg Radio Show. I hope you dig it, Merry Christmas, and I’ll see you all next week. Thanks in large part do a little expedition digging through my crates, this month’s episode focuses on the Beat Boom, with a wide selection of 64-66 UK grooves, and groups from elsewhere influenced by them. There are even a couple of weird little surprises along the way, too. 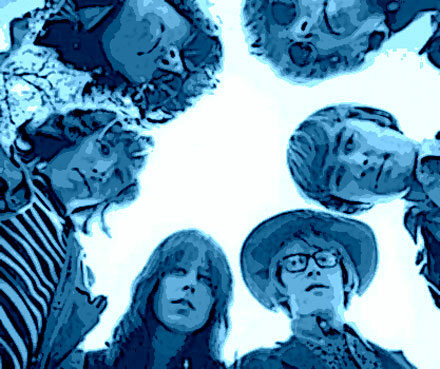 The tune I bring you today is a favorite of mine by the mighty Jefferson Airplane. If you were a kid growing up in the 60s and 70s, the Airplane – especially Somebody To Love and White Rabbit – were all but unavoidable. Later on, as the pop culture world started to regurgitate and redigest the 1960s, in movies and TV, those songs became sonic shorthand for what my friends and I always called ‘The 60s were a turbulent time!’, i.e. the clichéd opening line for countless documentaries about the decade. As a kid I had a copy of ‘Surrealistic Pillow’ that I played to DEATH and beyond, and it remains one of my favorite 60s LPs to this day. However, it wasn’t until 1990, when RCA put out the ‘2400 Fulton St’ CD compilation that I got a much broader, fully realized picture of the band’s music. As is the case when you’ve only been exposed to the hits, digging into a really interesting band’s discography can be a revelation. As I mentioned before, the Airplane’s best known songs became clichés, and Grace Slick remains today one of the most memorable icons of the 60s, both of these things taking away from a true appreciation of the band as musicians. They were much more than their hits (but you already figured out where this was going, didn’t you), moving away from blissful folk rock jangle into somewhat heavier stuff, psychedelia and political content. The albums they did between 1966 and 1972 (when they morphed – for better or worse –into Jefferson Starship) include some of the best sounds that the era had to offer. The deeper you get into the band, the more likely you are to turn your ears from Grace and Marty, and appreciate the input of Kantner, Casady, and of course, Jorma Kaukonen. It is from the hands of that last member that we get today’s selection, ‘Good Shepherd’, from 1969’s ‘Volunteers’. 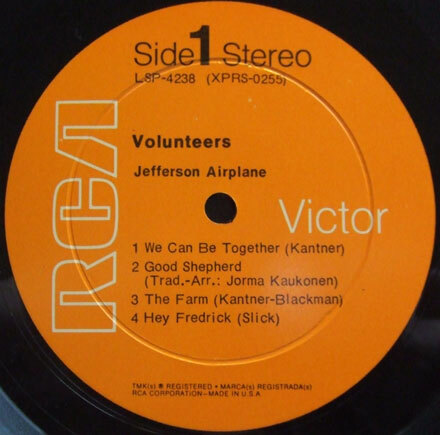 Recorded in the spring of 1969, but nor released until the fall of that year (though they were performing material from the album that summer at Woodstock) ‘Volunteers’ features some of the group’s best songs, including one of my faves ‘Good Shepherd’. The song itself is listed as ‘traditional’ and it is in fact a reworking/evolution of a tune that has its roots in and early 19th century hymn, and on up through the folk blues and Alan Lomax field recordings, which led to a number of folk revival-era versions of a song called ‘Blood Stained Banders’. If you listen to versions of that song (like the one by Mike Seeger) you can definitely see the framework of what Jorma would take and turn into ‘Good Shepherd’. He opens the song with acoustic guitar, then runs sharp electric leads over into the first verse (where the older title of the song makes an appearance). The Airplane version of the song takes on a loping, mellow (yet as the layers pile on, quite heavy) decidedly West Coast caste, with Jorma taking the lead and the rest of the group joining in harmony. Jorma takes a great – somewhat jarring – solo, followed by some wordless singing by Slick, and then back into the acoustic guitar. It is a very groovy vibe indeed, and something cool if all you’ve ever heard were the big hits.